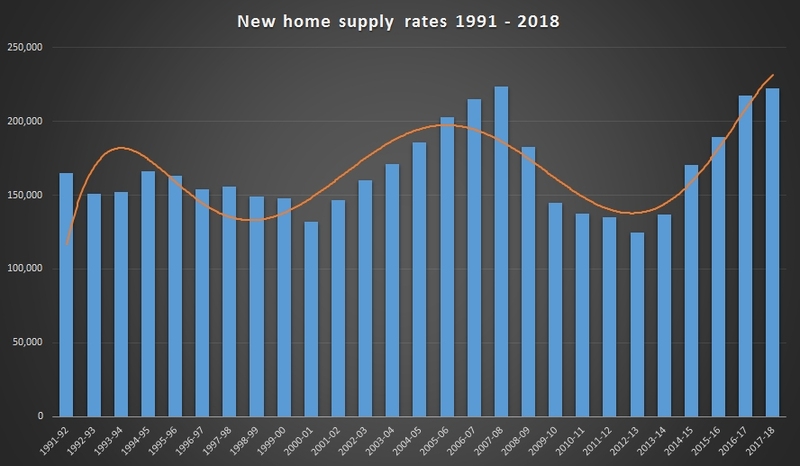 Analysis of data from the Ministry of Housing, Communities & Local Government (MHCLG) shows that new home construction is now almost at levels seen prior to the crash of 2008. The results show steady year-on-year increases since 2013, with the 2014-15 financial year showing an exceptional 25% increase on the previous year. 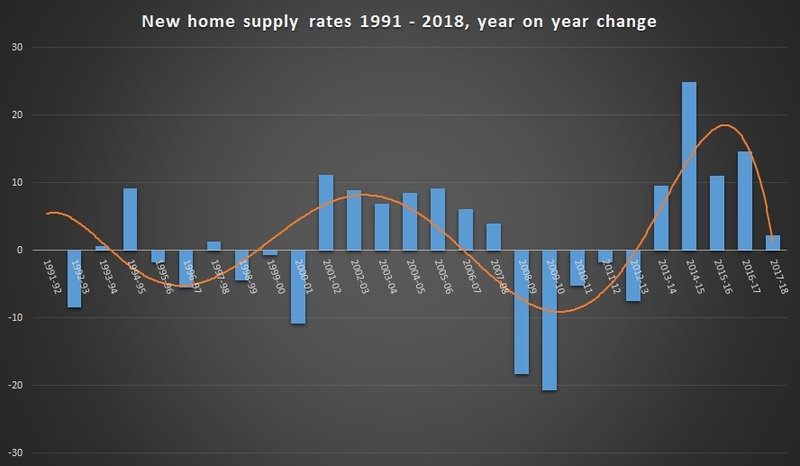 Whilst the rate of increase was more subdued last year due to Brexit uncertainties, the overall trend does show movement towards the Government’s target of 300,000 per annum. For instance, in the financial year 2017-18 around 222,000 new homes were built, which represents 74% of the Government’s annual target. From November 2018 the Each Council now measures home delivery via the “Housing Delivery Test” which provides an annual indicator of a Council’s housing performance. The Government now allocates Each Council a target number of new builds required to meet their estimated needs. Councils that fail the test must prepare an action plan detailing what they will do to increase new homes delivery. (Read more about the National Planning Policy Framework Revisions). 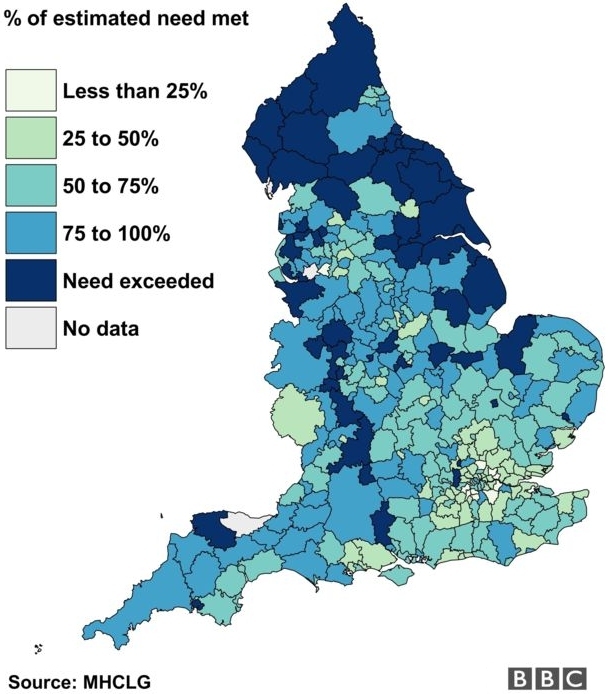 The BBC’s Shared Data Unit has analysed new build housing data across the UK’s local council areas to highlight regional variations in supply against these long-term targets. Findings reveal that only one in five local authority areas are building enough new homes to meet the housing needs targets set by the Government. Nine of the local authorities that build the fewest new homes are in London. Setting London to one side, three of the remaining bottom ten are in the Greater Manchester area. In contrast, Northumberland exceeded their target by 35%. Parts of Cumbria and North Yorkshire and three areas in Wales also exceeded their targets. In Northern Ireland almost half exceeded their targets. The Scottish Government do not set house-build targets for local authorities so were excluded from the research. As specialists in development land and new build homes LSL Land & New Homes can help at all stages through the development cycle, from buying land with or without planning permission through to new build development sales and marketing.